Super simple right? 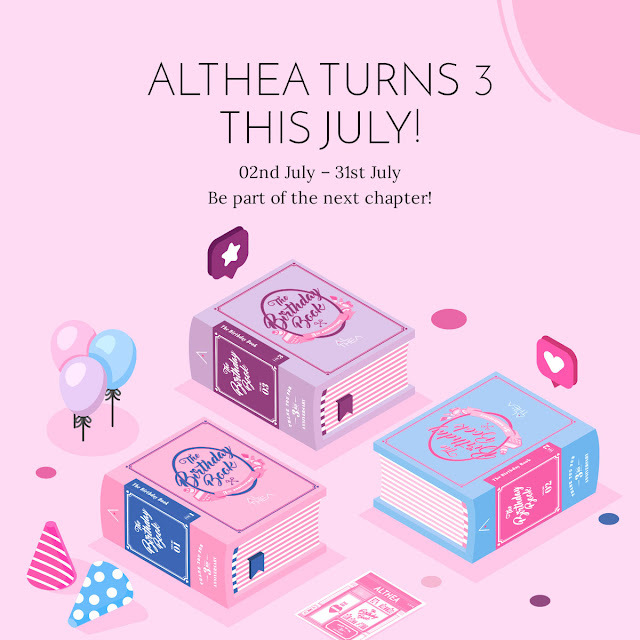 Just show off your "Althea Birthday Cake" creation on Instagram from 3rd July until 15th August, 2017, 11.59pm MYT to participate in our #AltheaTurns2 Instagram Contest. On the D.I.Y Birthday Kit that you receive will have instructions on how to assemble your "Althea Birthday Cake" to enter the contest. 1. The Contest is open to shoppers of Althea Korea only. 3. Participants who purchase any products from Althea from 3rd July – 15th August 2017 are eligible to enter this contest and/or claim prize(s). 4. Althea Korea’s decision on all matters are final and binding. No correspondence will be entertained about Althea Korea’s decision. 5. 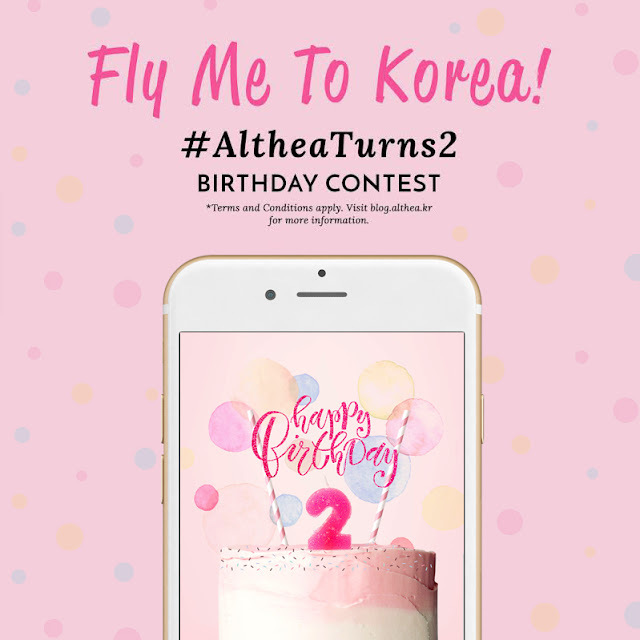 Althea Korea reserves the right to disqualify all entries that do not meet the rules and regulations of the contest or to assign new winners in the event the original winners are unable or unwilling to fulfil the terms of this Contest. These include entries submitted with invalid or incorrect information. 2. 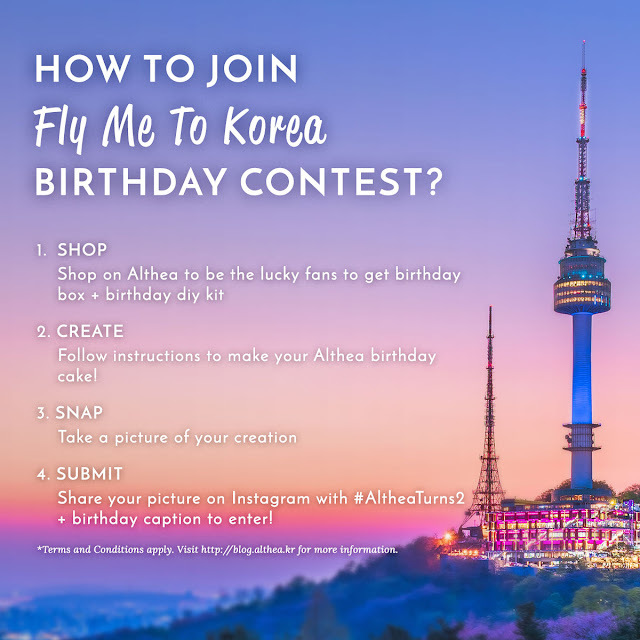 Winners and prizes are decided based on their creativity on their picture as well as caption of the post showcasing Althea’s Birthday Box and Birthday Kit creation. 6. The grand prize winner will be gifted with Air Asia Electronic Gift Vouchers (eGV) worth USD800 for the purchase of the flight tickets on www.airasia.com. The grand prize winner will comply with all the terms and conditions of the use and redemption of Air Asia Electronic Gift Vouchers (eGV). 7.The first prize winner of a year's free shopping on Althea will be given monthly Althea credits to shop on www.althea.kr. The monthly credits are capped at a maximun of USD100 per month. The winner shall receive this in his or her Althea account of country of origin with the value at the prevailing currency exchange rate. 8. The second prize winner of three (3) months free shopping on Althea will be given monthly Althea credits to shop on www.althea.kr. The monthly credits are capped at a maximun of USD100 per month. The winner shall receive this in his or her Althea account of country of origin with the value at the prevailing currency exchange rate. 9. The ten (10) consolation winners of USD$100 Althea credits will be credited the value (after prevailing currency exchange) on their Althea account of country of origin to shop on www.althea.kr. 10. The prize of Althea shopping credits are valid for 30 days from the day the points are awarded to the winner’s Althea account. Awesome. I would like to go there to enter in the contest and have some better time to enjoy it. Thanks for sharing update about it. Would love to discover Korea ! ! ! ♥♥♥ ! ! ! ^^ I have placed my order on the 3rd of july, am I enterring the contest??? just want to be sure! thank you for your help and hi! from France ! ! ! Hi love, to check on your parcel please head over to your account on Althea's site. :) If it's passed 15 working days and you haven't received your parcel, please email help@althea.kr. 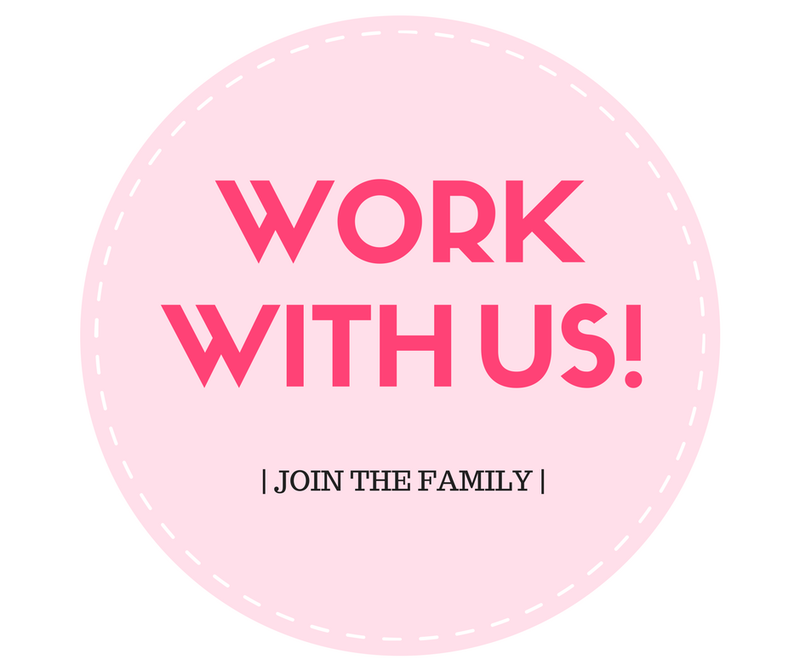 Alternatively, contact our pixies on Facebook at Althea's page. :) hope this helps! Hi Althea Korea. Good afternoon. I'm very sad. :( I received my packaged today. theres's no free samples included :( Why? Oh no! We're so sad to hear that. :( Unfortunately our samples were while stocks lasts for the birthday month. Our elves do randomly put samples into orders during other times though, so good luck for the next time! Hope this helps. Hi,why is the birthday giveaway item for today is the same on the previous day?the missha undereye brightener,is that the birthday giveaway for today? No, don't be sad! It runs till the 15th of August 2017 :) Be sure to read the above article for more information on the contest. Good luck! Woah joining! I would really love to visit Korea and also see Althea office :) Happy Birthday Althea Korea - best Kbeauty destination! Hello I have put my order 4 package since july 10th, I really really want to join this contest, but all my packages are still in processing 😢 so sad 💔 is it possible my package will arrive before august 15th? Do I have a chance to join this contest? Orders usually take 10-15 working days to get to you, so we've got our fingers (and toes!) crossed for you! <3 It exceeds 15 working days, please do email us at help@althea.kr so we can help you sort it out. Good luck! Hi, I received the ordinary box + DIY birthday kit. Can I still join the context even if my box is not the birthday box? Thank you. I hope to win...(fingers crossed) though I've seen the other birthday box entries from other Altheans,they're so fabulous,there are lots of pretty good entries,even I, myself will find it hard to decide who's going to be the grand winner...Good luck to every Altheans! I so hope my birthday box will even get noticed by Althea's pixies/mermaids, I've put all my heart into making that my own unique version inspite of my super tight and busy schedule as a working housewife! Gosh I'm so excited ! We're still in the midst of deliberating and going through the entries. Our elves and pixies are working very hard, so hopefully it'll be announced soon :) Good luck!